Appearance: The hieroglyph for the basket was a symbol outline of a bowl, which approximated the appearance of Egyptian wicker baskets. The hieroglyph was often painted yellow or green to match the color of the plants used to make the baskets. Egyptian baskets were made from plants, such as rushes, palm leaves and grasses. More detailed images of the symbol showed horizontal lines or a checkerboard pattern to give the appearance of basket weaving. Meaning: The nebet hieroglyph portrayed the concept of two words that sounded identical. Neb, "all" and neb, "lord" or "master". The glyph was used interchangable to represent these concepts. On the chest from Tutankhamun's tomb, seen above, the baskets' are repeatedly representing "all". They are a wish for the king to enjoy "all life and dominion." The basket, was used in many amulets in this type of imagery. The basket could also represent, "lord". Deities were often shown sitting or standing upon the glyph to emphasize their divine nature. The vulture and the cobra (see glyph) were often placed atop the basket to identify them as the symbols of Upper and Lower Egypt, and not just ordinary animals. 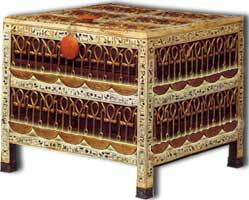 In the pharoah's nebty (Two Ladies) title, the goddesses Nekhebet and Buto were seated on baskets.